Send Money Transfer To The Philippines: TransferWise And Save! The cost of sending money transfer to the Philippines concerns many Filipinos abroad. I met a childhood friend in Milan, Italy who complained of high bank fees when he sends money. He said that banks double charge from transfer fees and unfair exchange rates. He was right. And he is not alone. Millions of OFWs, immigrants and Pinoy expats pay high fees because of lack of cheaper options of sending money to the Philippines. When I learned of TransferWise, a money transfer firm with lower and no hidden fees, I got excited! But Filipinos abroad could not avail the service right away. I emailed TransferWise (T-Wise for short) and asked when it would offer Peso in its service. After two months it informed me of its launch in the Philippines. Eager to review this new method, I went to my computer to send money to my account. TransferWise is cheaper than Xoom money transfer. T-Wise’s minimum fee is $3 for $300 and below. Above $300 the fee is 1%. So for $1000 it is $10 transfer fee. TW deducts the fee from the amount. Add the fee if sending a certain amount. I sent around PHP3500 which was $82. Deducting the $3 fee left $79 for conversion to Peso. At that time the exchange rate was 45.0893 to a dollar so I would get PHP3562.05. I switched screen to check the rate at Xoom. With lowest fee of $4.99, total amount would be $86.99 for PHP3581.35. Check Xoom money transfer why this is so. But Xoom allows you to send up to $2999 for only $4.99. For $3003.99 your recipient get PHP131,386.20 as of this writing. Also at this writing, $2999 at T-Wise sends PHP134,125.80 at honest rate of 45.17526 to a dollar to your recipient. $2999 already includes the transfer fee. Try it with the tool below by putting the amount to send. Are you in the Eurozone, United Kingdom, Switzerland, Sweden or Australia or other countries in Western Europe? You can also send money to the Philippines through T-Wise. But you cannot use it yet if you are in Saudi Arabia, Hong Kong, Singapore and other countries. Update: T-Wise is now available in Singapore. Sending money through T-Wise is simple. I just sent money through its website so I will walk you through the process. Click here to go to TransferWise website in another window. I will wait for you here. Sign up as a member first by clicking “GET STARTED”. Give your email address and create a password. You can also use your Google or Yahoo account. Once you signed up you can now send money in 5 easy steps. Enter the amount and change the currency into USD if you are sending from the United States. Then change the recipient currency into PHP for Philippine Peso. You will see how much your recipient will get. The screen shows you the amount of fee and the current exchange rate. You will also see the amount of saving if you transfer the amount through bank. It says the money will arrive in 2-3 working days, which means 2-3 banking days. This is good for non-emergency money transfer to the Philippines. Enter your and your recipient’s details. Click “SEND MONEY TO A BANK ACCOUNT” to fill the recipient’s bank name, account number, phone number and address. You will find major banks such as Banco De Oro (BDO), Bank of the Philippine Islands (BPI) and other banks from the drop down menu. Check the amount, the name of the recipient and the date of delivery of the money transfer. Confirm the recipient’s bank name, account number, phone number and the amount you are sending. You can type a message to your recipient at this point as well. You must now fund the transfer. You can choose bank debit or wire transfer when sending from the US. Bank debit withdraws money from your checking account. 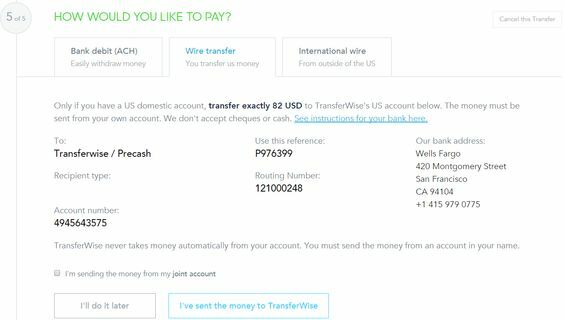 Wire transfer uses your US bank account to transfer to TransferWise’s US bank, Wells Fargo bank. Put the reference number shown on your screen when using wire transfer. TransferWise wire transfer funding option, screen grab from TransferWise. Since I do not live in the US and was testing this method, I used the third option which is international wire. I then received two emails from TransferWise: the first when I funded the transfer, the second when T-Wise received the money. TW sent the money within the day of its receipt. When I checked the status of the transfer the next day, it was already in my account in the Philippines! The verdict? TransferWise is a cheaper option to send money. Transfer fee is low and exchange rate is fair. You will know how much money you will send to your loved ones. With this I highly recommend TransferWise for sending money transfer to the Philippines for not urgent remittance. Send money transfer to the Philippines now through TransferWise and save. How was your experience in sending money to the Philippines using TransferWise? Share your story here! Other readers will thank you for it.